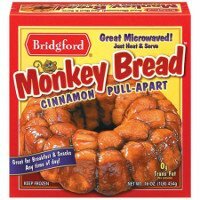 Bridgford Cinnamon Monkey Bread Pull-Apart can be found in your grocer's freezer. It is great microwaved. Simply heat and serve!